Thanks for the photo Mahaut Vidal! 3pm til 5 pm this Sunday (25th November) – Celebrating the old Stijl Tuin behind Huize Frankendael. The day after, gardening contractors will dig up what’s left and begin to restructure the garden. Edward Clydesdale Thomson, artist in residence is organising gluwijn, hand tools, plant care advice and a good send off for the plants. The Yew trees will be moved to the local cemetery de Nieuwe Ooster Begraafplaats (which is also a national arboretum) so we won’t be touching them but everything else can go. That’s the mature Box hedging (buxus), Catnip, Day lilies, Japanese anenomes, Acanthus, spring bulbs, Artemisias and more and more and more. The following day, restructuring of the garden will begin. 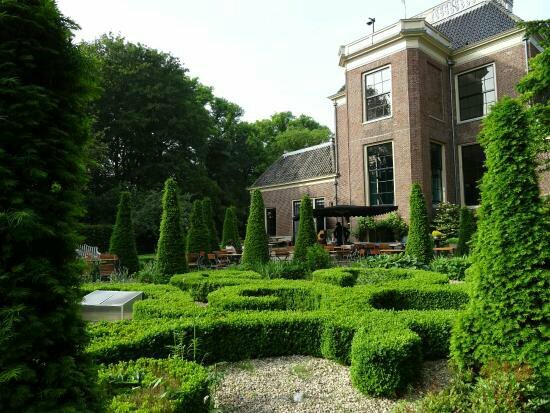 The Stijltuin behind Huize Frankendael is an officially listed historic garden and whilst keeping the original design intact, new plants are to be added. Join us on Sunday afternoon if you can!